New information about an edition of Mark Twain’s  Conversation as it was by the Social Fireside in the Time of the Tudors. Recently, among the ‘many more,’ a twin pair of editions have become better known. The two are the work of a member of Princeton’s class of 1912, Eugene V. Connett III. Prior to founding his own imprint, The Derrydale Press, Connett did commission design and book production for well-heeled Eastern bibliophiles like himself. For some years, it’s been known that Connett produced in 1925 a 100 copy edition of 1601. [Title page illustrated above.] This edition is well described in the standard bibliography of the Derrydale Press, compiled by Henry Siegel and Isaac Oelgart. [It’s entry A on page 34.] Furthermore, Connett also produced in 1925 a 30 copy edition, less typographically complex than the 100 copy edition. We now have an answer. In the course of preparing a bookseller’s color-printed catalogue of the Derrydale Press, Princeton Class of 1983 member Henry Wessells discovered who “H.D.W.” was. He did so by following up a note written by Connett and tucked into a copy of 1601 that appeared in a New England auction a number of years ago. This direct evidence from Connett, Wessells learned, is also confirmed by circumstantial evidence found in the Derrydale Papers. 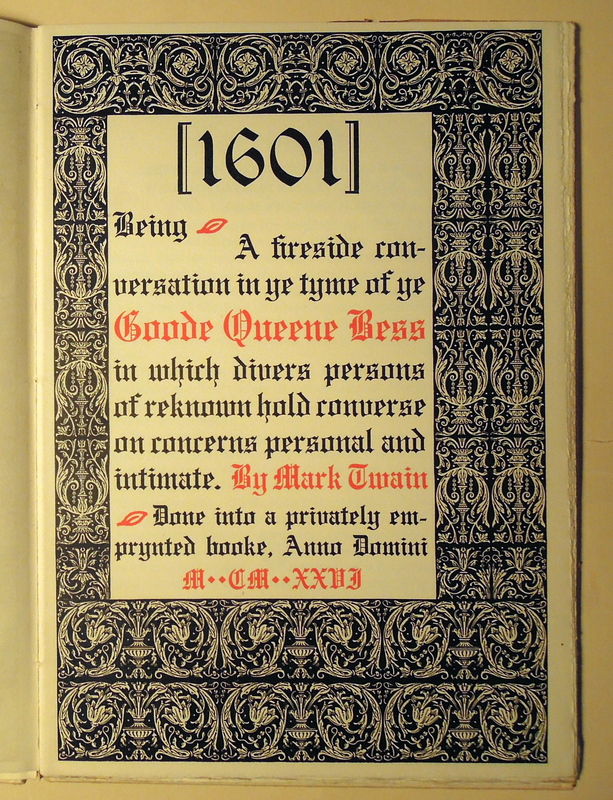 ❧ [Mark Twain]  Being a fireside conversation in ye tyme of ye goode Queene Bess Done into a privately emprynted booke, 1926. ❧ With thanks to Henry Wessells for providing many details. This entry was posted in Noteworthy long-held accessions by Stephen Ferguson. Bookmark the permalink. I have the “1601” by Mark Twain. Copyright 1935 by The Swan Publishing Co. Elizabeth City, N.C. Price 20 cents. If anyone is interested in this, please contact me.